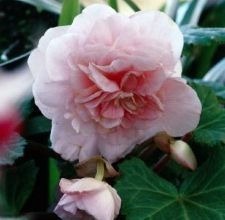 Begonias are shade-loving ornamentals with a range of foliage and flowers. Flowers come in singles and doubles with plain or ruffled edges, in colors from white and yellow through shades of pink and red. Begonias yield seasonal color from late spring through early fall. Begonias grow in moist, shady gardens where they have well-drained soil, wind protection and filtered or indirect sunlight. A typical blooming season starts in June and ends with the first frost. They are so easy to grow that a broken stem or leaf stalk stuck in soil often roots as a new plant. Wax begonia cultivars like Challenger and Pizzazz grow under 1 foot tall and tolerate seasonal sun and heat. Dragon Wing cultivars, showing off leafy canes 2 to 3 feet tall, yield flowers from spring and into the frost season. Tuberous begonias like Non-Stop, reaching 1 to 2 feet tall, bloom all summer and tolerate some heat. Tuberous begonias, usually grown from tubers or garden center plants, produce seeds. Seed companies cover the tiny seeds, numbering about 1 million seeds per ounce, with clay or other material to make them easier to handle.